Please complete the form below to contact us by email. 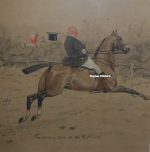 The Gilbert Holiday prints below of Hunting, Horse Racing, Polo and Military pictures represent a small selection of the many original works available by Gilbert Joseph Holiday. If there are any paintings in particular by Gilbert J Holiday that you are looking for then please contact us on 07889 800857. He spent his early years in Winchester where he was educated and then studied at the RA schools. He worked on The Graphic, The Tatler and The Illustrated Sporting & Dramatic News. For a while he shared a studio with Lionel Edwards on whom he had an influence (Edwards says in his autobiography that Gilbert Holiday was the most untidy worker and smoked incessantly). 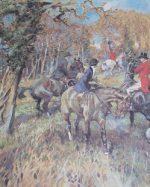 Having served as a gunner during the First World War, Gilbert Holiday painted many military pictures and was a keen horseman but painted many equestrian scenes of Hunting, polo, racing, coaching and show jumping. Holiday was a sensitive artist and highly regarded by his contemporaries, in particular, Snaffles and Lionel Edwards. 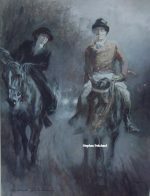 Lionel Edwards said of him “ no one can paint a horse in action better than Gilbert Holiday could”. He depicts speed and movement correctly in the first place (he was one of the first artists to understand the movement of a horse), by blurring outlines and in some cases losing feet totally in dust or mud and depicting lumps of mud flying through the air. He worked in oil, watercolour, pastel, crayon and frequently combined the latter three. Gilbert Holiday had a serious fall whilst hunting with The Woolwich Drag, whom he hunted with regularly, which eventually led to his death. 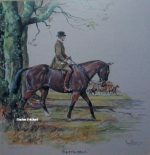 A few prints were published after his work, mainly of hunting, racing and military scenes, but they are all quite rare. Gilbert Holiday is widely considered one of the great sporting artists of the twentieth century. Copyright © 2019 Stephen Pritchard. Powered by WordPress. Theme: Spacious by ThemeGrill.